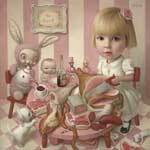 Mark Ryden devotees should be ready to move on two new items about to drop any minute at his personal website. On sale May 1st, 2006, a limited edition, signed and numbered lithograph poster of “Rosie’s Tea Party.”?No pre-orders or fax orders will be taken for this item. More information will be posted as it becomes available.